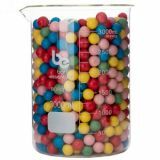 Large Bar Essentials 2000ml measuring beaker made from borosilicate glass, graduated with pouring spout. Check the image to confirm that you are happy with the graduations on the side of the beaker. 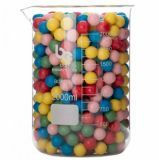 These beakers can be heated - but please avoid flames touching the glass by using a fine wire gauze between the heat source and the glass. Diameter of top (rim outer): 143mm. Diameter of body (Outside Diameter): 130mm. Numbered graduations: 500ml, 750ml, 1000ml, 1250ml, 1500ml, 1750ml. Non numbered graduations: 625ml, 875ml, 1125ml, 1375ml, 1625ml, 1875ml.